After the school dance, a man set up a ladder and cut down all the stars. Malcolm stood below and caught them as they fell. He walked home with an armful of stars, trailing yellow balloons behind him like wings. I love the morning after any balloon-related event. The balloons seem tired, and if you give them a little tug, they don’t quite make it back to the ceiling. This is my favorite time to take pictures – I like it much better than during the party itself. I love the boys in their pajamas batting balloons back and forth or racing around the house with them. The morning light hanging in the balloons like fire, lighting them with a warm glow from within, making them almost as bright and buoyant as my boys. I took so many photos this weekend, of the boys and their balloons – I took hundreds! I lay on the ground for some, looking up at their laughing faces, and up the strings to the golden balloons. (I had just seen an Ozu movie!) I was so happy with them that I didn’t even look at them right away. I saved them for after work. And when I loaded them onto the computer I could see the tantalizing little thumbnails of the shots vivid with our green walls, strong morning light and radiant boys. But the pictures never loaded. I never got to see them, I lost them all, and all of the photos from the dance. I feel such irrational regret about this loss. They’re just pictures! David and I tell ourselves all the time not to experience our life through a lens. We want to capture every moment and remember every movement, but sometimes we have to just put the camera down and live it. Trust our eyes, trust our memory. I know that. So why do I feel such an odd small pang of nostalgia for these pictures I’ll never see? I suppose it’s like the films I make in my dreams. So perfect and unattainable – so perfect because you can never see it as it really is, because things always look better caught sideways in glimpses, memories, and dreams. Oh, well, there will always be more balloons!! These brownies have coconut milk in them, which makes them soft and almost pudding-like. They also have flaked coconut and chocolate chips, which makes them delicious! They’re not terribly sweet, and I used very very dark cocoa, which almost has a savory flavor to it, according to my taster. You could use regular cocoa, though, and they’d still be tasty. Preheat the oven to 375. Lightly butter a brownie pan. Melt the butter. Transfer to a bowl and mix with the sugar. Beat in the eggs one at a time and then beat in the vanilla. Add all of the dry ingredients, and mix till smooth. Stir in the coconut milk. Spread in an even layer in the brownie pan. Bake 25 minutes, give or take, till it’s pulling away from the pan and feels fairly firm to the touch. Spread the glaze over the surface evenly. Turn off the oven, and return the brownies to the oven for about five minutes, till the glaze is melted. Let cool and set before slicing. 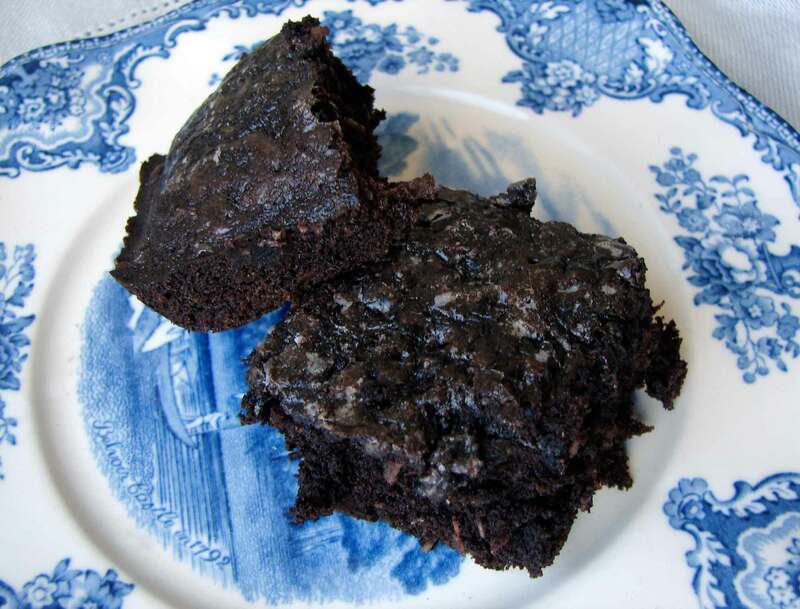 This entry was posted in cake, chocolate, dessert, recipe and tagged baked pudding, coconut brownies, fudgy brownies by Claire. Bookmark the permalink. I have been reading and enjoying your blog since the beginning of this year, and I decided it’s about time I told you so. Maybe it was the image of the balloons in combination with the coconut brownies that prompted me? So thank you, and one day I will get round to trying out some of the recipes as well! THank you so much for taking the time to let me know!! And for your kind words.